We enjoyed staying in this park on our way to the lower 48. The staff was friendly and helpful. The park including the showers and restrooms were very clean. Our site was spacious and level. This park is a little off of the main road, but easy enough to get to. Wi-Fi is available, but at an extra cost. We decided to forgo it for our stay. We camped at Dave's RV Park and Campground in a Travel Trailer. Nice looking campground..... The grounds are well kept and neat, and the manager is serious about running a good operation. The roads are good and the site spacing is adequate. We had a level easy-in/easy-out gravel pull thru. No comment as to the quality of the restroom or shower facilities as we did not use them. My only complaint centers around the seemingly endless add ons to the base price. Evertyhing is extra. Sure, I understand the concept of tailoroing unit costs according to one's wants and needs, but I reached my limit when I was told I'd have to buy a separate internet ticket each for my iMac and our Kindle Fire HD. Two WiFi charges? The additional charges should be noted on the list of services provided. They are not. We camped at Dave's RV Park and Campground in a Travel Trailer. The park is well organized,clean and has easy access as others have stated. The roadways are gravel which may become dusty if the park is busy. The additional charges for Wi-Fi and cable TV are a bit annoying, but the owner's philosophy is user pay. He believes not everyone wants those services so why should they be included in the basic cost. We stayed 3 different times in July so would definitely stay again if in the area. We camped at Dave's RV Park and Campground in a Travel Trailer. 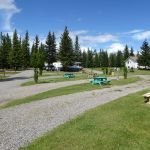 Dave’s RV Park is in a lovely quiet setting east of Vanderhoff, BC. They have had the park for 20 years, and it is clear how much love and care they have put into the park. There is a putting greens area, a huge checker board outside for the kids and pretty flowers. The sites are close together, but not too close. Some of the sites are up against the woods, and others have trees. The restrooms and showers are absolutely spotless, some of the best we have seen on the whole trip. Some of the sites have cable TV and other don’t. The Wi-Fi is great! We caught up on all the old emails with ease. Owner and his wife welcomed us with grace and a warm attitude, something you don’t see all the time at RV parks. I’m sure, over the years, they have made many people feel welcome in Vanderhoff. They sure did us. We camped at Dave's RV Park and Campground in a Travel Trailer.